Just haven’t been in a blogging mood for the rest of the week … and today this is just a quick post before I go sit down in front of a DVD with my stitching – my mission today is to get the majority of the stitching done on one of my exchange pieces, ‘cos I realised I’m seriously running out of time – next week is a really busy one, as Fraze is coming to stay on Wed night, and I have close friends coming over on Fri morning from New Zealand to stay the night, and I’m then heading up the coast to Seaford for the rest of the weekend with a couple of girls from work. So, I’m not allowing myself to be sidetracked with anything else today … that means, of course, I’m behind on blog reading yet again – but only by a few days, so it shouldn’t be too hard to catch up … that’s my job on Monday, if I don’t manage it before then. Before I go, though, I’ll quickly post my Ebay spoils piccie … here is a HUGE display of my daylight robbery last week – I’m almost embarrassed at the price I got some of it at, although they were through businesses not individuals. The funny thing is that the business I bought the Shepherd’s Bush needlerolls from (as well as all those VS charts very cheaply), is where I’d seen the SB needlerolls here in the flesh … and in the store they were AU$42 each – ridiculous, for what’s actually in the kits! Anyway, I’m very happy I could get my hands on a couple for a reasonable price, to help satiate my current needleroll obsession 🙂 Some of the VS samplers I’ll never stitch in their entirety, but I thought of using parts of them to make up needlerolls … see, totally obsessed!! 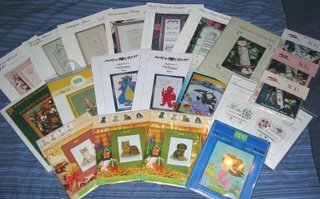 Most of the other little kits were for use in my charity stitching. Right, off I trot to my stitching chair – I think the weather is even going to cooperate today and give us a bit of blue sky and sunshine, so I might drag my chair back into the sunlight for a while to save me having to use my daylight lamp at 10am! Wow that’s quite a haul 🙂 Have a great weekend. Wow what a great stash hall! There is a Pinn pattern down in the front of the pic that the fash bounced off of. It looks interesting (to me 🙂 ) could you take another pic of it or send me a link to where i could see it. This might have just jumped into my to do list. 🙂 Thanks! Anne, you got some real bargains there!! Hope you can get to your guild meeting (of course, it’s already over,lol). I felt very uneasy and out-of-place for probably the first year I belonged to the SAGA group. But I stayed with it and have learned so much! Wow, I know who to ask if I want to borrow some VS charts. LOL. You did really well with that pile – congratulations! You must be very excited to have them in your hands. I hope you had fun stitching today. It’s raining here and Terry actually suggested last night that I spend the whole day stitching, so I need to drag myself away from the computer and get back to it! WOW!!! Great stash! 🙂 Victoria Sampler is just great and Shepherds Bush Neeedlerolls….hmmmmm…lovely…. Nice stash haul you have there.